What are you made of? – Fitness versus fatness. For both athletes and the general population, your body composition is an essential measure of health and fitness. With 2012 on the horizon, professional sportsmen and women know there is nothing more detrimental than carrying out dead weight. So, for those considering a weight loss program, accurately assessing your body fat percentage is one of the most important measurements you can take. Moreover, with the knowledge that excess body fat is directly linked with a number of serious medical conditions, including heart disease, diabetes and certain cancers, accurate measurement and continual monitoring is crucial. With the London Olympics only 2 years away, Tanita Corporation made the decision to push their brand and products further into Europe through international print advertising for both consumer and trade campaigns. And in March 2010 following a creative pitch from several marketing communications agencies, Tanita Europe selected Design Inc as their preferred partner. 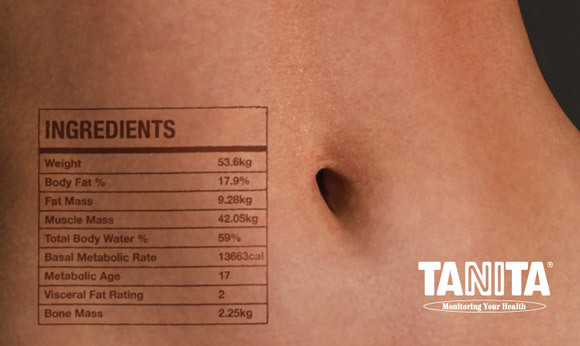 Our winning creative promotes an aspirational message: healthy bodies tattooed with a ‘food packaging ingredients’ list.